American technology pioneer InFocus, today unveiled their latest smartphones InFocus Snap 4 and Turbo 5 Plus in the Indian market. Keeping in mind the Indian consumers’ love for selfies and photography, the uniquely designed InFocus Snap 4 comes equipped with 4 amazing cameras (dual rear and dual front) whereas the elegant Turbo 5Plus offers 3 cameras (dual rear and selfie camera), making them a desirable companions for amateur photographers for clicking clear and sharp images while on the go. Becoming a perfect companion for selfie lovers and amateur photographers, the InFocus Snap 4 is equipped with 4 cameras; 13MP AF with 8MP dual rear camera with LED Flash Light, Digital Zoom for vibrant images and 8MP dual front facing cameras, to capture moments and click bright pictures to create memories even in low light conditions. The fingerprint sensor on the device is very responsive. Powered by MediaTekMT6750N, 1.5 GHz OctacoreCortex-A53 processor and the Android Nougat operating system, the smartphone offers smooth and seamless performance along with easy multi-tasking. The Snap 4 offers striking and clear display with its 5.2 inch2.5D Curved Display, HD On-Cell IPS screen. It is crafted for a premium look and the elegant all metal uni-body finish makes the smartphone more desirable. It comes loaded with 4GB RAM + 64GB variant which is expandable up to 128GB memory (through micro SD) making it an ideal device to store data, images and videos. Adding another smartphone to the Turbo series, is the newly launched InFocus Turbo 5 Plus which flaunts a 13MP AF and 5MP dual rear camera with Digital Zoom and a 5MP selfie camera, for clicking clear, lively, and sharp images. The Turbo 5Plusoffers a rich experience with intelligent and stylish features. The MediaTekMT6750, 1.5GhzOctacoreCortex-A53 processor enables a quick response with smooth multitasking option. The device is backed with a 4850mAh battery which lasts upto34 days of standby time. Sporting a 5.5inch, HD IPS 2.5D Curved Display, the sleek uni-body metal finish adds style to this device. It also becomes a perfect companion for rich multimedia experience for long hours. The front fingerprint sensor is responsive making the accessibility to applications easy for the users. The smartphone has an in-built 3GB RAM and 32GB ROM which can be further extended to 64GB with micro SD card. 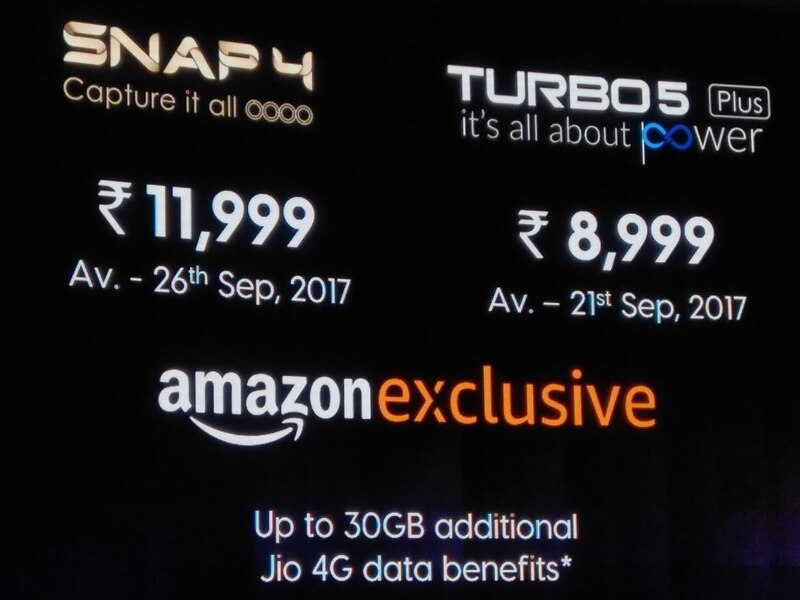 The InFocus Snap 4 will be available at Rs11,999 from 26th September 12.00 pm onwards while the Turbo 5 Plus will be available at Rs8,999 from 21stSept 12.00 am onwards. Both the devices will be exclusively available on Amazon.in.